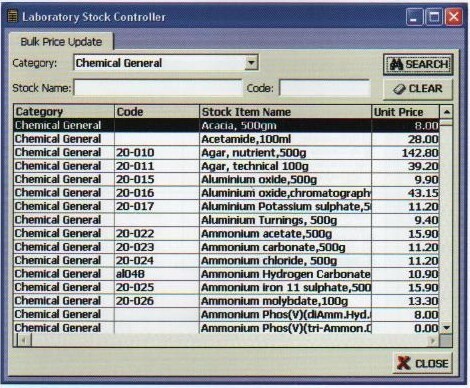 The Omega Scientific Laboratory Stock Controller is a simple and efficient programme which will enable you to maintain accurate stock and location records of all your science equipment and consumable supplies. A sheet feeding printer (laser or inkjet versions are recommended). 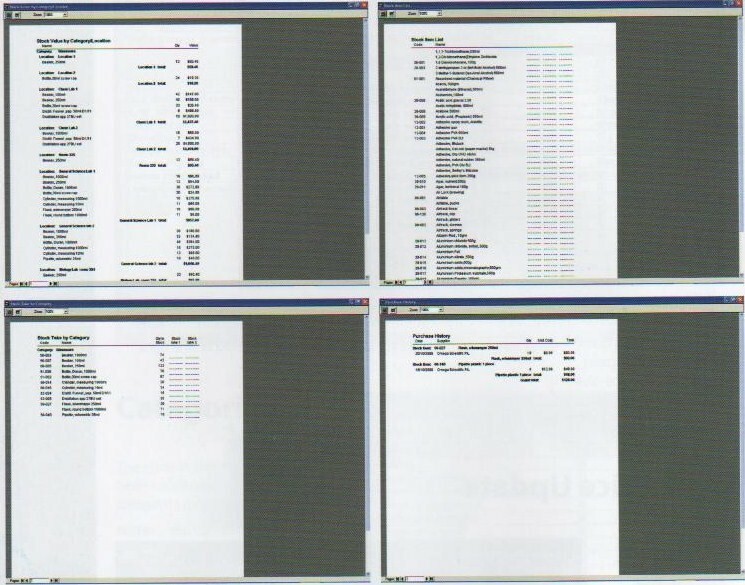 The main screen has button icons for all the major data areas in the programme.Click on the image above to enlarge. a comprehensive list of science equipment and consumable items has already been entered for your convenience. Items can be deleted or added to meet your school requirements. 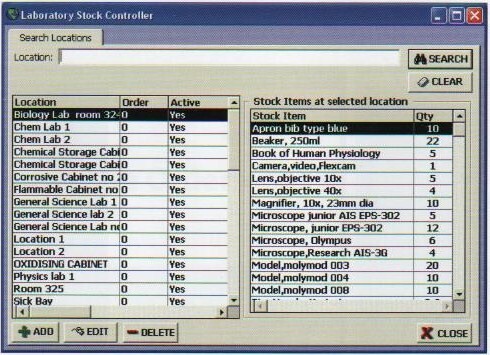 Simply enter the quantity of each stock item that you have and record the various locations that it is stored in. You can also enter the supplier details and the unit cost of each item. Note: This screen shows that you have one Camera, video, Flexcam in Biology Lab room 324. It cost $1350.00 and you purchased it from Omega Scientific Pty Ltd. The category highlighted is Microscopes. At the bottom of this screen is the total value of all the items listed in this category. How do you use this system to change your stock details? Click on item name. Click on edit. This screen will appear. You can change quantities, add a purchase history, record safety checks or breakage history. If risk assessment details need to be recorded you can include this as well. 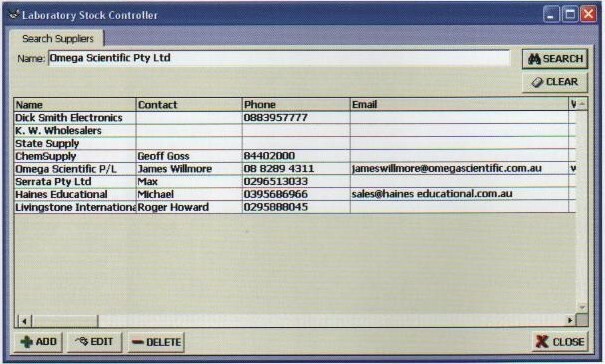 Simply enter your suppliers' details into the programme for easy access. The items in this programme have been subdivided into the following categories for your convenience. Note: You can add, edit or delete these to suit your own requirements. Unlimited numbers of locations and categories can be accepted. You can allocate a number to each category to "rank" their priority. Eg: If you want Biology, Physics and Glassware to come up first, list them as order number 1, 2 and 3 and they will always appear at the top of your listing. If you do not have any items in a particular category, eg: Earth Sciences, list them as "no" under active and then they will not come up until reactivated. Know exactly where everything has been stored and how many of each item are in each location. 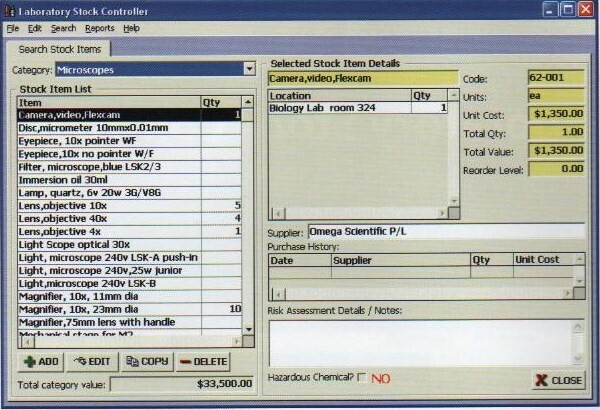 This screen shows that in Biology Lab room 324 there are all the items that are listed on the right hand side of the screen. 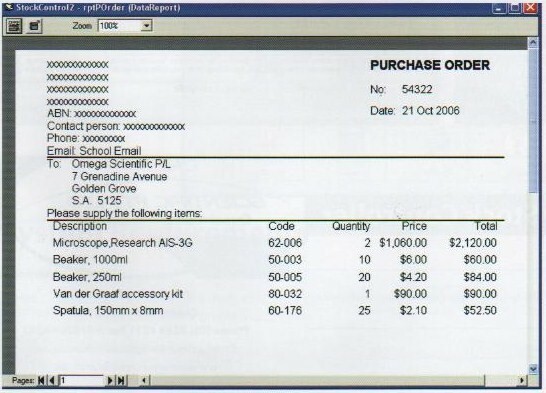 The current prices for the 2006 South Australian Science Bulk Science Order are listed for your convenience. You can update and alter prices to maintain accurate records and can enter various suppliers and pricing structures in addition to these. These prices are used to calculate your overall stock value - helpful for insurance purposes. You can print reports on purchase history, stock item lists, stock reorder lists, stock take by category, stock usage by category and stock value by category/location. 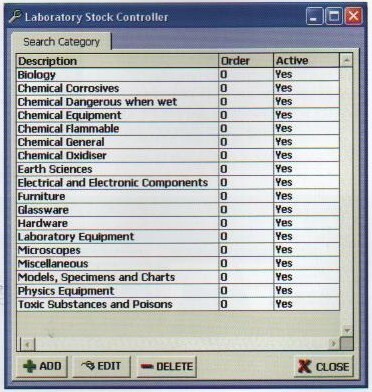 if your computer is on-line, by clicking on the Safety Sheets icon you can access the complete and comprehensive range of MSDS sheets from Chem Supply. 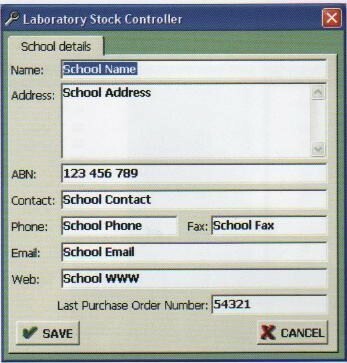 Place your orders directly from this computer programme to your supplier via fax or email. Use this screen to enter your school details. This information will automatically appear on any purchase orders you wish to send. Built into this programme is a comprehensive help guide that will assist you in all stages of using this programme.